I've already talked about how sweet potatoes can be healthier than regular white potatoes - and I was really chuffed when my children started asking for them instead of their regular fries. 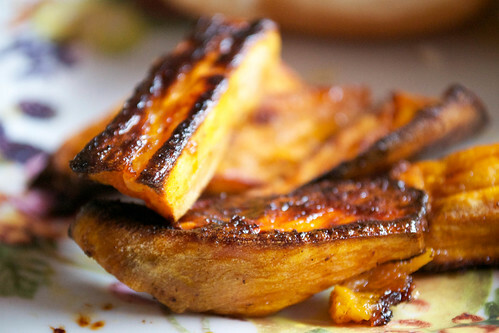 Sweet potatoes are great boiled and then mashed, or baked in their skins and topped with a slice of creamy goat's cheese and some chives - but for the ultimate in comfort food we often have them like this: sticky, sweet and burnished from the heat of the oven, making them beautifully crisp. Serve with some sour cream and chives or garlic mayo if you like. Sweet potatoes also go really well (Jamie might even say they're 'best mates') with rosemary, so you can always chop a few rosemary leaves and toss them into the roasting tin before baking. Preheat your oven to 200ºC. 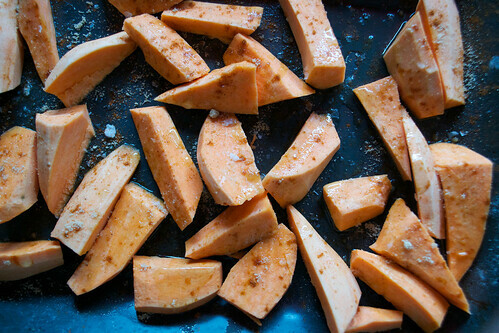 Peel the sweet potatoes and cut them into chunks, like in the photo above. Lay them out in a single layer on a shallow roasting tray and sprinkle with the salt, smoked paprika and sugar. Drizzle with a little olive oil and toss with your hands to make sure the potato wedges are coated in the mixture. Bake the wedges for about 30-40 minutes (this will depend on how big you've cut the pieces), or until they are glistening, sizzling and slightly burnished around the edges.